Benny stepped out of his cabin, the Apollo cabin. He traced his fingers along the decorative handle of the golden door before he yawned and stretched out his arms. His guitar was slung on his back, as always. His black hair was shaggy and messy and yet it appeared as though he spent hours of his morning to get it to look that way. Benny wore his usual style of clothing, a plain white v-neck shirt and dark blue jeans. Looking up at tte early morning sun, Benny smiled and pulled his guitar to the front of him. The wood was lightly colored with darker accents accents. There was a sun engraved on the frot of it. Benny began to strum his guitar and walk into the cabin Courtyard as he did so. now I'm trying I get back. I reckon it's again my turn..
to win some, or learn some. Benny hummed along to the rest of the tune, strumming along on his acoustic guitar and siting on the edge of the fountain. Ashleigh gently shut the door of her cabin, hugging several research papers close to her with her right arm. How long had she spent pouring through her chemistry books? Five hours? Well, Ashleigh knew she completely missed breakfast thanks to her stomach's occasional moanful protests. And, anyway, it wasn't the first time this week. She was used to missing breakfast, solely relying on granola bars to fuel her up. Taking a deep breath, Ashleigh allowed herself to soak up some sun. It was a lovely morning. After a few long strides towards the fountain, she heard a familiar tune. Though, knowing her nonexistent musical talent, she wouldn't pinpoint it immediately. Her converse made squeaking noises as Ashleigh reached the granite tiling of the courtyard. Looks like they haven't dried from yesterday's training. Pity. With a sigh, she disregarded the music and stomped towards the fountain. The sun prickled her skin, and her platinum blonde curls made it less cooler. Why, among all things, did she forget to tie her hair up? It was a completely careless move. "Oh, darn it." Ashleigh cursed as she accidentally dropped her papers. First the tie, and now this. Maybe staying in for the day wasn't a bad idea after all. DJ laced her creamy fingers lace around the doorknob of her wine-smelling cabin. She then trusted the front door open, letting a breeze blow in. Those blue-eyes of hers shut as the wind blew black strands of hair into her face. "Meh, too breezy," DJ muttered, and the stepped into the courtyard. Behind her, the door was wide open into the wide cabin. You could easily view the Wine-Fountain, which was close to DJ's bed. Luckily. Once again, her hands grasped the doorknob, this time on the outer-side of the door. She pushed it backwards, and let the door fall into place. DJ yawned, stretching her arms out wide. Being so short, if next to an average-height person, her arms in the air would reach their, maybe, neck. Yet, DJ loved her smallness. Easy to fit through vents to crawl through. DJ strolled to the fountain, a common rest place for the bored. Along her stroll, she heard a song being played. It sounded somewhat familiar. Now, the teen directed her direction to a girl looking like a mess. Yes, the girl looked smart, but a mess. Maybe a female Albert Einstein? DJ thought. Noticing how... quiet, it was, DJ decided to make some noise. Noise aside from the chick-Einstein or the musical-master strumming his guitar. A hi, perhaps. "Howdy," DJ greeted, walking a little closer. Her black flip-flops squeaked in the dewy grass. Benny heard the two and turned, moving his guitar to his back to help the girl pick up the papers. He had seen the smart looking girl around camp before but had never spoken to her. He gathered her fallen papers, flashing a white smile as he handed them to her. "Here, dang gravity always brings things down," he said before tuning to the small, petite girl who was approaching. Benny gave a nod of his head and a friendly smile. "Hiya," he greeted, giving a sloppy wave of his large, guitar playing hand. Without waiting for a response, Benny flopped to the ground, leaned against the side of the fountain and strummed his guitar quietly. "So, you both miss breakfast too?" he asked, glancing up at the two with his signature, goofy grin. The rest of camp was at breakfast except for the three of them? It seemed as though it was something the gods had set up...Vent simply shrugged his shoulders and quietly hummed to the made up song he was playing. Ashleigh whispered a barely audible response of gratitude as she took the papers from the guitarist, then placed them in a neat pile in front of her. Clipping the papers with a small paper clip produced from her pocket, she knelt on the ground and pushed her sweater's sleeves up. There had to be something to tie her hair with. Bringing her wrist into closer view, Ashleigh spotted a brown rubber band which clearly wasn't for hair use. Guess it would have to do for now. It took her a few seconds to tie all her hair up, with hardly any strands loose. The rubber band felt strong enough to hold for at most four hours, but knowing the untamable mess Ashleigh grew up with, the rubber band was definitely of temporary use. Clenching her jaw, she looked up at the two campers. They were familiar. Though, she had never talked to them before. Ashleigh nodded once to show she knew of their presence, albeit that was all she could muster out. Talking wasn't really her cup of tea. Scratch that. Being sociable wasn't her cup of tea. Unless, of course, it required devising tactics for the next battle plan. "Yeah. I missed breakfast." Ashleigh said bluntly, thinking it rude to let the boy's question go unanswered. That piece of knowledge didn't carry any consequences anyway. DJ studied the two. They looked familiar, but not people DJ had talked to. It was obvious their god parents: They guy was an Apollo kid, the girl, Athena. The guy sang, first of all. And the girl? We already discussed this. DJ stepped a little closer to the two. Yep, familiar, she thought, Aren't they named like, Brian and Anna? Her sigh filled the courtyard. The boy, named something with a B, slid down besides the fountain. He flashed a goofy grin after asking a goofy question. "If it's breakfast time and I'm not eating breakfast, then yes," DJ said, her sarcasm filling her, "I missed breakfast." Her eyebrow raised as she looked down the the boy. Turning towards the girl, DJ urged to ask if she was related to Einstein. ADHD won as the daughter of Dionysus asked, "You part of Einstein's family tree?" It made DJ chuckle a little. A good joke wouldn't hurt, right? Maybe mixed with the sarcasm.... Oh, did DJ really care what they thought? Nah. Benny looked up at the girl and chuckled. "Oh, I though maybe you just scarfed down your food because you knew that I'd be here and you just had to meet me. Am I right?" he retorted with just as much sarcasm. 'Hm...feisty,' h thought, studying the short girl a moment before turning back to his guitar. He grabbed his capo, moving it to the third fret of the guitar. He began playing a sing he wrote, but he kept the lyrics to himself. The tune seemed to flow through the air, like water in a beach. Voices of campers in the mess hall could be heard in the distance. Faint parts of conversations were audible, and Benny found them to be intriguing and slightly confusing. Benny looked up at the short, sarcastic girl as he heard her question. His bright, richly olired blue eyes studied the smart-looking girl the question was directed towards. Benny pursed his lips a moment before he turned back to his guitar. "Nah...she's to pretty. Did you ever see Eistein looking like that?" he pointed out. Benny pulled his favorite, black, elastic, head band out of his back pocket and slipped on his head. It hit about the middle of his forehead and wrapped around his cranium, causing his black hair to flip put in random places. Benny continued o pluck the silver strings of his guitar in silence, glancing at the two girls every now and again. Ashleigh felt a strange rush throughout her body. Pretty? Ha, he must have been mistaken. The heat must've gotten the poor boy delusional. Clearing her throat, Ashleigh looked up at the petite girl; eyes squinting against the sun's rays. "I won't bother tracing my blood line." Her voice carried no emotion, as if the words were like empty containers. Yet, she still got her message through. Ashleigh cleared her throat once again, this time scanning through her papers. Yep, the algorithms and equations were just about complete. Maybe she could take this to a Hephaestus camper and work out a collaboration? That would have to wait a few more days, despite her eagerness. She straightened the pile of papers, then tucked a stray strand of blonde hair behind her ear. The cashmere sweater she was wearing didn't make things less hotter, it actually made her feel the humidity more. DJ looked at the boy and scowled. Sarcasm was her thing, not his. I need something to drink... she thought. Maybe if she ran back to the cabin to get some wine? Nah, she was fine here. Then, this boy called the brainiac pretty. Pretty? DJ thought wondering if the guy was blind, Let the nest on her hair untie and bam! She's Einstein. The teen looked at Benny with another scowl, but the scowl ended quickly. This guy, like most people, was already on DJ's last nerves. Then, the girl started talking. Scowling was too much, so DJ let out a huff. A huff sounding like... sarcasm. Trying to at least get some words out of them, DJ asked, "Who's your immortal parent person?" She put her hands on her hips and raised an eyebrow. "Oh, and I'm DJ," she introduced herself, "daughter of Dionysus." Now, it was their turn to say their name, God parent, etc. DJ was patient, and could wait all day for an answer. Well, if she could run back to get some wine a couple of times. Maybe get tipsy... Too many trips for that. DJ tapped her foot now, along with the strum of the guitar. Even she had to admit, the guy was good. Not like excellent, but well-enough to listen to. The melody was different. She was sure the boy had wrote it. Carson open his cabin door groggily and sauntered towards the cabin courtyard. His stomach screeched in protest, and tried to drag him towards the mess hall, but he resisted. He walked over to the group who were gathered in a small bunch in the middle of the courtyard. "Hey guys," his voice full of drowsiness and hunger, "I'm assuming you all missed breakfast?" He chuckled softly, then yawned whilst stretching his hands. He still hadn't gotten enough sleep from staying up last night for the lightning show, and boy did he show it. Earlier, he had attempted to make something of his bed-head hair, then wound up falling asleep again. Yeah, not the best plan. So now, his hair was back in it's bed-head form, with strands of hair sticking out randomly. He was still in his clothes he had worn last night, his sweatshirt to match the sky, tattered and teared black jeans, and he had slipped on his favorite pitch black shoes. His eyes were still the same as always, an electrifyingly blue which shone like the stars. His stomach growled yet again, and this time Carson had to snap his fingers for an electric current to run through his body and not let his wanting for food take over. Carson pretty much towered over all of the group, his blue eyes lighting up and giving the group a smile within them. He attempted to comb through his hair, and failed miserably, however getting the attention of some when electric sparks flew out of his fingertips. "Er, sorry about my awkward and sleepy appearance," He told them solemnly. "Didn't get enough sleep last night." And just to make a point, or so he thought, he closed his eyes and almost immediately fell to the stone paved ground. Fortunately, he caught himself before he did actually slam into the cold hard stones, and got up slowly, blinking. "So would you folks mind introducing yourselves? Haven't seen you before on campus, which is weird, as I've been here pretty long." 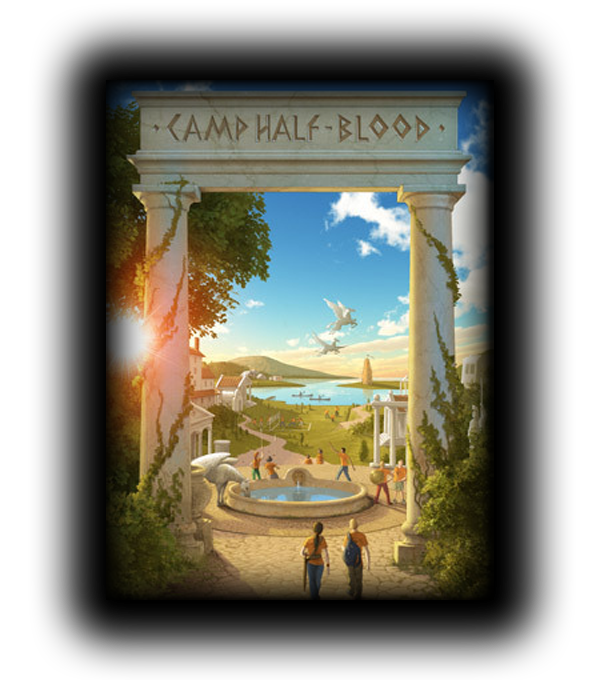 I smiled broadly, remembering all the times I had when I was smaller and in Camp Half Blood. Ain't nothing like a good flashback to get you some stares. I walked into the Courtyard still groggy from last night. I smiled to myself. I had just gotten back from a two-day-long block party in Leroy. Where there was enormous amounts of beer and girls and whatnot. I chuckled thinking about seeing Mackenzie there. My old girlfriend. Ahh...Mackenzie, beautiful with shoulder-length straight light auburn hair. Big chocolate brown eyes and a better body than most girls. Too bad she had to go back to Tennesee. Oh well. I looked down at my stained white T-Shirt and old Levi's. There was a hole in one pant leg with string and fuzz hanging off of it. I let out a huge yawn and greeted the girls in the Courtyard. "Hi." ~Post phail. I had no inspiration. Ashleigh stole a quick glance at DJ before rearranging her papers to a more accessible order. The girl was clearly impatient, easily angered. And perhaps didn't quite like the silence. The corner of Ashleigh's lips curved a tad bit, forming a small smirk before she pursed her lips and went back to rearranging. Impatience and anger couldn't do anything worthwhile, except arouse more heated arguments from the group which wouldn't make any sense. Hearing a few more footsteps approach, Ashleigh remained silent and weighed her options. Option one is to stay and be social. Option two is to not be social and leave. Naturally, the latter seemed more interesting than the other. But then the footsteps stopped. Taking a quick peek behind her, she noticed a tall guy roughly two meters back. He, too, looked strikingly familiar. Then, Asleigh turned to the direction of the small 'Hi' she had heard. Looks like DJ wouldn't go unnoticed after all. Shrugging once, she went back to fixing her papers. "Ashleigh Trace," A quick second of silence then, "Daughter of Athena." Benny turned to the three and gave a nod. "Benny, Son of Apollo," he said simply, turning back to hi guitar. He had never been one for quite people. He liked loud, goofy people. He plucked the strings of his guitar a few more times before he rose to his feet. "So, can I ask a question, DJ?" he asked, although he didn't bother waiting for a response since he assumed it'd be no. "Did you just wake up on the wrong side of the bed? Or were just born cranky?" he asked, stretching out his arms as though what he had just asked was not insulting. He had never been one to care about other's feelings. Benny's bright blue gaze flickered over to Ashleigh a moment before they returned to DJ. Did the girls have a history? Or did they just know that they wouldn't like eachother? It didn't make sense...how could you just automatically be rude to someone as though you hated them when you had never even met them before?